"Terry Preston and Ferlin Husky"
Hillbilly Revue, AFRS is a fun bit of Country Music nonsense was produced for the entertainment of our troops. The show is hosted by "Cactus Pete", a character originally developed for kiddie TV shows on Southern Illinois station WSIL by Jim Bolen. On the Hillbilly Revue, Pete interviews popular Country Music personalities. Terry Preston was the name used by Ferlin Husky in his early recording career. 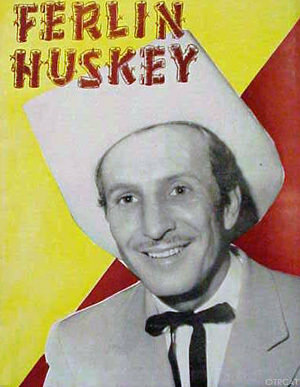 Husky was an early force in popular Country Music. While working on Troop Ships during his stint in the Merchant Marine during WWII Husky found himself entertaining the Troops during the long voyages. He became adept at impersonating other audiences. He would explain that he would learn the songs by listening to the recordings, and felt that he should do them as closely as possible to the original style. Join Cactus Pete and the gang as he rounds up the hottest old time radio country music stars. Be the first to comment on "Hillbilly Revue"